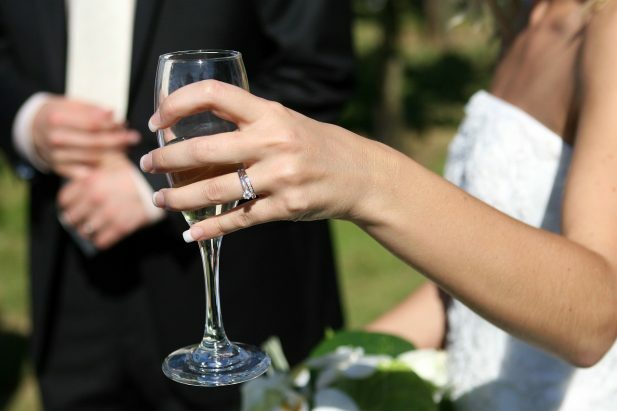 Wine on your wedding day is just about as traditional as saying ‘I do’. Whether it’s a few bottles on each table or a glass for the toasts, the happy couple generally splash out on some fizz to keep their friends and family entertained. As a nation of wine lovers, a fruity tipple is as popular as ever in the wedding industry – and we’re telling you how the bride and groom can add a touch of personality to their wedding day with their wine choices. Whether it’s funny wine labels to give your guests a giggle or bottles of personalised prosecco ideal for the toast, you can make your wedding all about you by adding a touch of individuality to your big day. Treating your guests to personalised wedding champagne is guaranteed to get the party started – and whether it’s a favour designed for your guests to take home or a bottle boasting a picture of the bride and groom, your wine choices are guaranteed to be a topic of conversation! At Hannibal Brown, we love a wedding – and with our wide variety of personalised wedding wines and personalised champagnes, you can make your day one to remember!